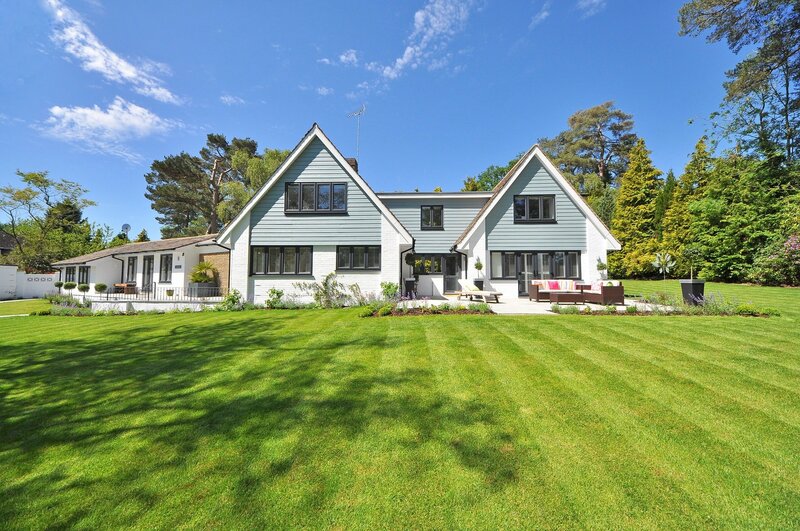 This is Post #4 of the 2018 Home Trend to Watch Series. View the third one: Wood Treatments. Fringe is nothing new. It’s been around for ages. The Native Americans used it on their garments as a method of routing rainwater. In the 1920s, it grew in popularity with the flapper dress and even became a political statement in the 1960s with the hippie movement. But by the 1980s, it was well out of style. It has since popped up on fashion runways but its popularity has not taken hold again, and only occasionally has it been seen in home décor. However, Pantone has predicted fringe will be a hot new trend in 2018. 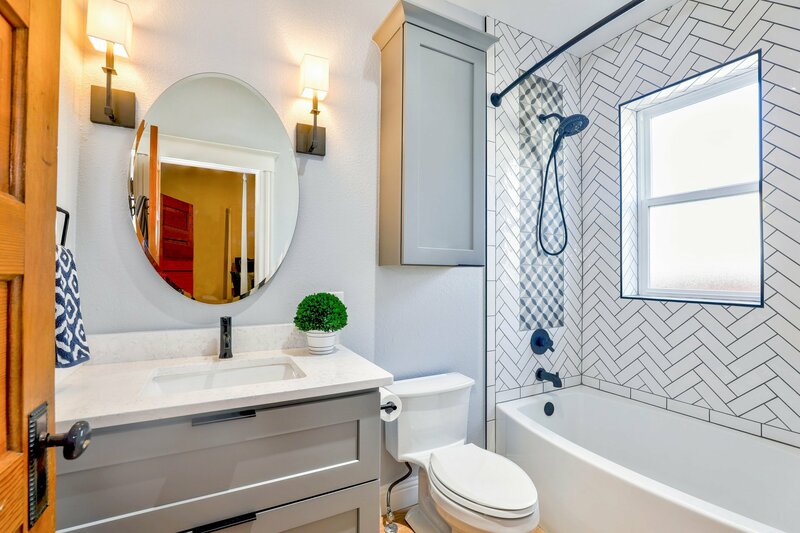 Below are some examples of how you can incorporate it into your own home. When it comes to home décor, blankets and pillows are probably the most popular items for fringe. Despite its waning popularity, fringe has remained prominent on these common household items. However, it’s important to note that not all styles of fringe will follow the trend expected to dominate in 2018. The thick or chunky fringe often seen on fleece blankets, and the tassel fringe found on pillows from decades past, aren’t as in-line with what we’ll be seeing. When picking blankets and pillows with fringe, remember that clean and simple is the route to go. 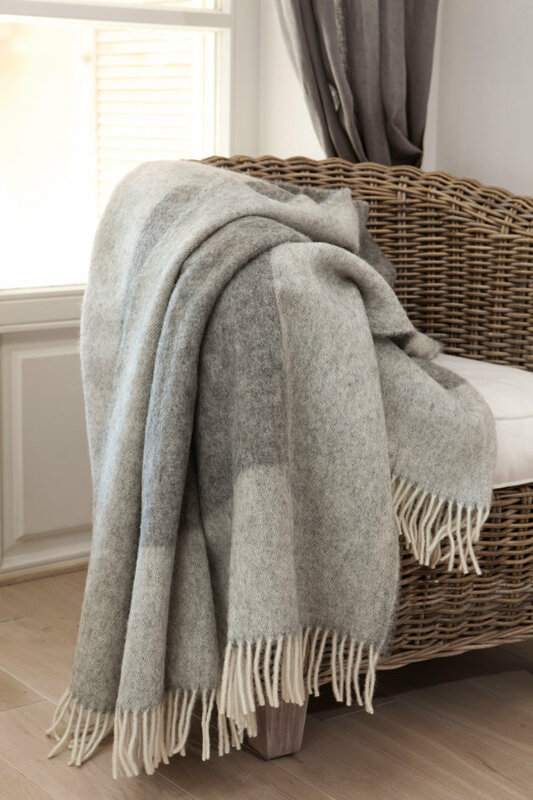 The classic fringe border on this wool blanket from BOTEH is probably the best example of what to look for. The colors are lovely and the fringe blends well with the wool. 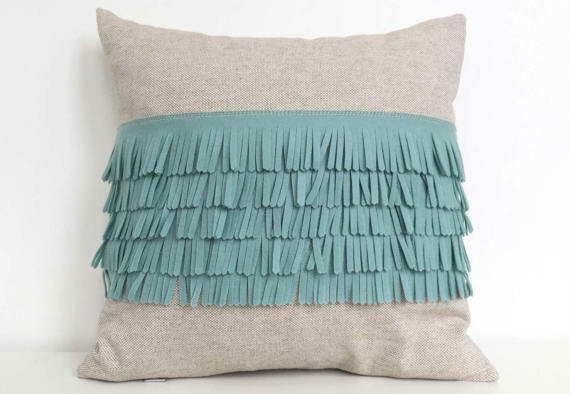 This felt and cotton linen pillow from Cheeky Monkey Home is a fashionable example of how fringe can be used on pillows. Rather than using fringe as a border, which is the most popular choice, it’s used as a decorative detail across the middle. A little bit of fringe can make a dining room feel light and summery. That’s why it’s a great addition to table linens, like napkins, runners, and covers. We suggest a short fringe, not only is less awkward on napkins, but it will keep the table runner from looking raggedy after a few months of people and chairs rubbing up against it. 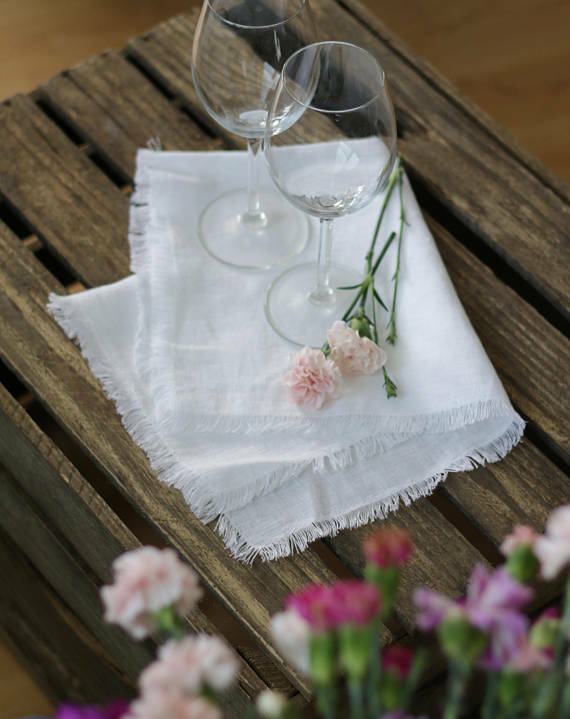 These beautiful white linen napkins with fringe are from RPLinen. They look delicate like they should be used at tea time in the garden, but they hold up well in the wash. They come in a variety of other colors, as well. 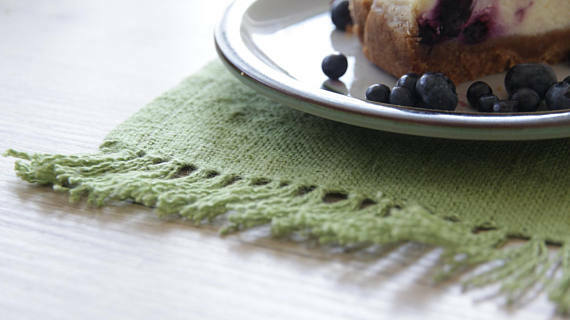 This rustic green table runner with fringe is from LinenSpace. It fits the farmhouse style that is very popular in home décor right now. 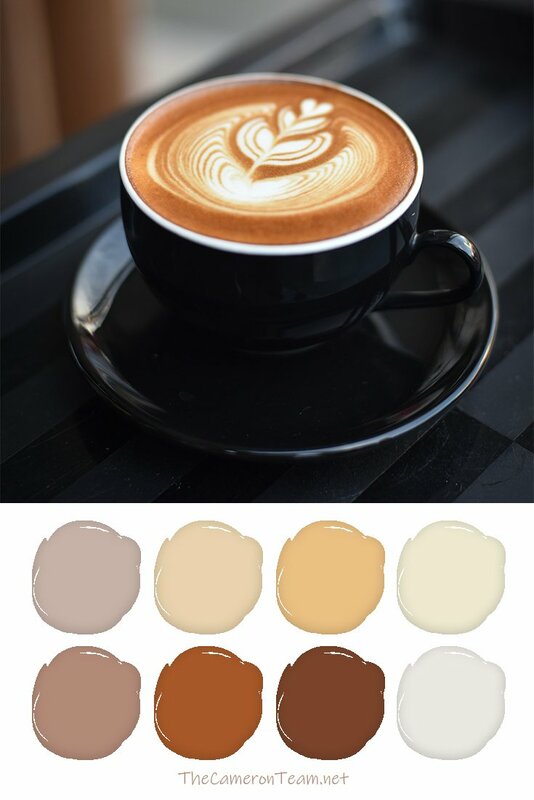 Its design is simple but adds a wonderful texture to a smooth table top. 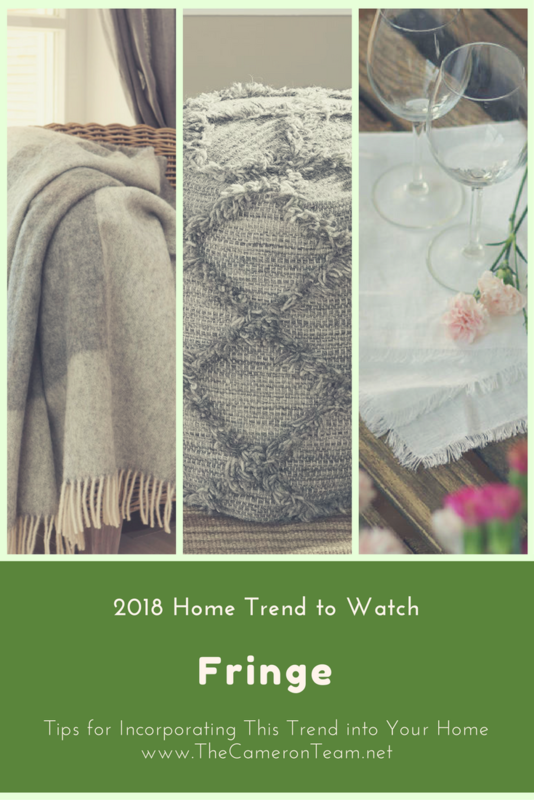 Like other 2018 home trend predictions, fringe is finding a prominent place in wall art. If you like to do crafts, wall hangings are easy to make. But if you don’t have a crafty bone in your body, there are plenty of purchasable options. Have a beach theme in your home? 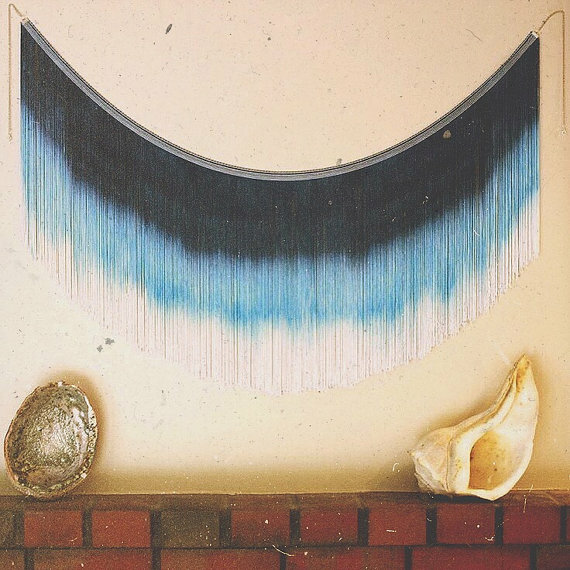 This wall hanging from Crafturday was inspired by the ocean. The ombre reflects the changing color from the deepest depths of the water to the shore. 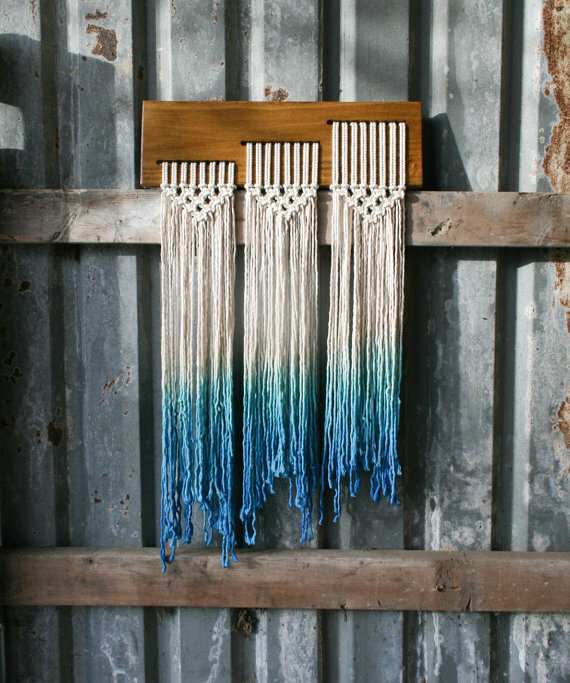 Or there’s this dip dyed blue macrame ombre wall hanging from TIEDbyLoretta, which has the added wood element that adds a nice contrast and helps to keep the shape of the strands. 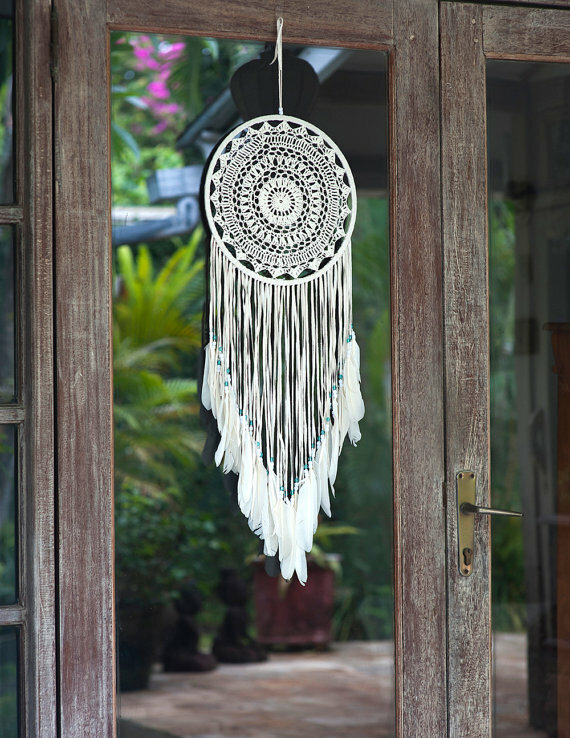 A dream catcher can also be a great way to add some fringe to your décor. They can be found in a variety of colors and materials. This decorative large white dream catcher is sold by BohemianTreasureSHOP. Finally, want just a little fringe? Want to also include typography in your décor? 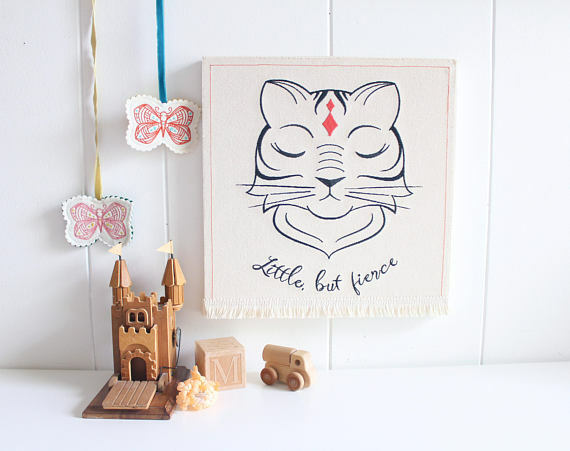 This tiger wall art from Leela and Jojo includes both predicted trends for 2018! Fringe will be making a comeback with small furniture, like footstools and ottomans. These are often decorated with layers of tassels and fringe, but try to consider a more modern approach – clean lines and simpler designs – unless, of course, you’re aiming to replicate a Victorian parlor. 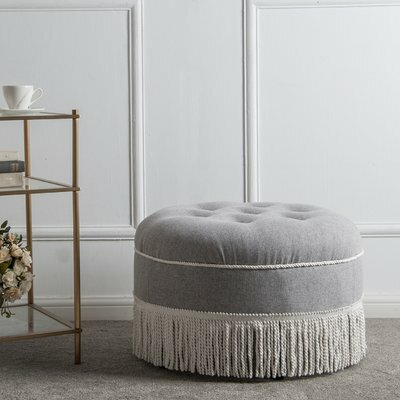 Check out this round ottoman from Astoria Grand. The cotton linen blends are made to fit a “lived in” home and the simple design blends well with contemporary styles. Looking to add texture? 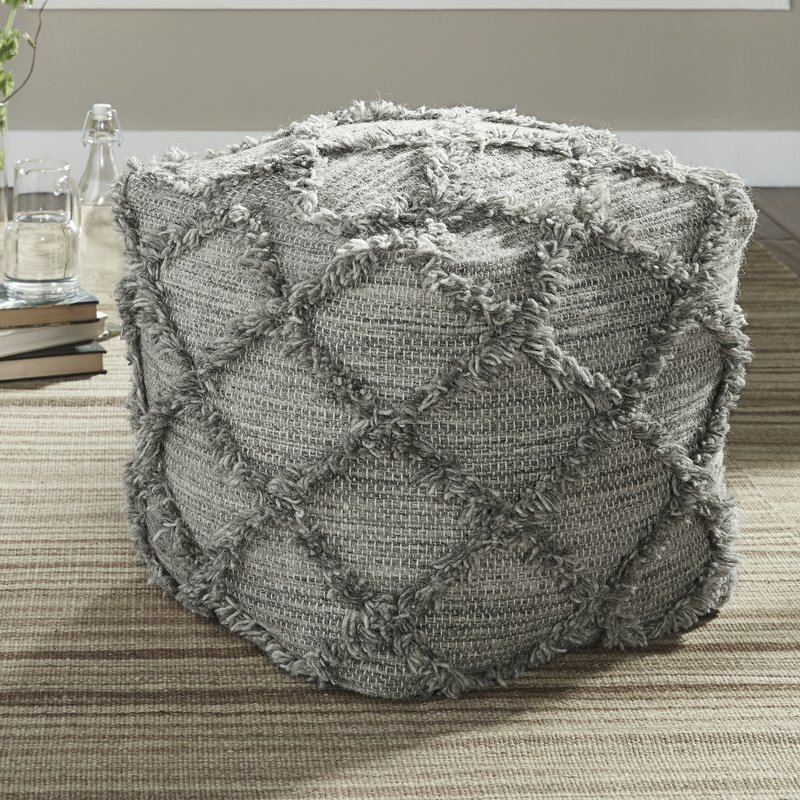 This pouf ottoman from Mistana has a diamond pattern all over and works great as extra seating in a small space. These are just a few examples of how the fringe trend can be included in your home décor. Just remember, use it sparingly. A pillow here. A wall hanging there. Too much can look gaudy. Matter-of-fact, what is one household item with fringe that you should avoid buying? Lamp shades. 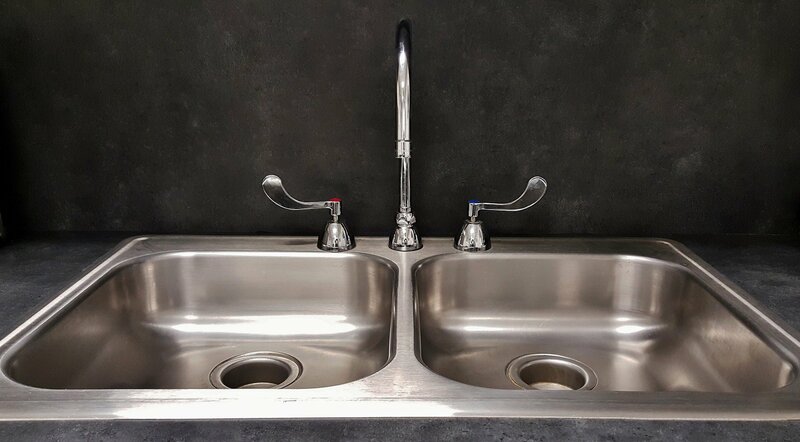 More often than not, they tip the gaudiness scale. It can be hard to find a piece that shouldn’t just remain in the antique store. Do you have a favorite fringe design idea? Share it in the comments!